This was originally a guest post I wrote for SprinklePop’s blog. It’s too good not to re-share here, because the sprinkles on these cupcakes are the prettiest Valentine’s Day blend I’ve ever seen! Whether you’re celebrating Valentine’s Day with your s/o or Galentine’s Day with your best gals, it’s the perfect reason to whip up something sweet, pretty, and made with love. If you’re looking for a dessert that’s quick and easy (but looks like you spent lots of time and effort! ), this cupcake project is for you! 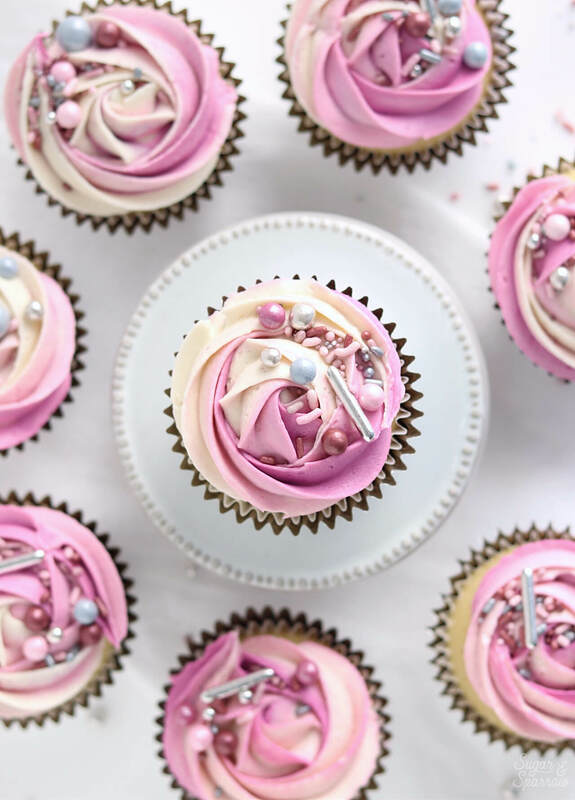 All it takes is your favorite vanilla buttercream recipe, pink food color gel of your choice, and this stunning Romance sprinkle mix by SprinklePop. 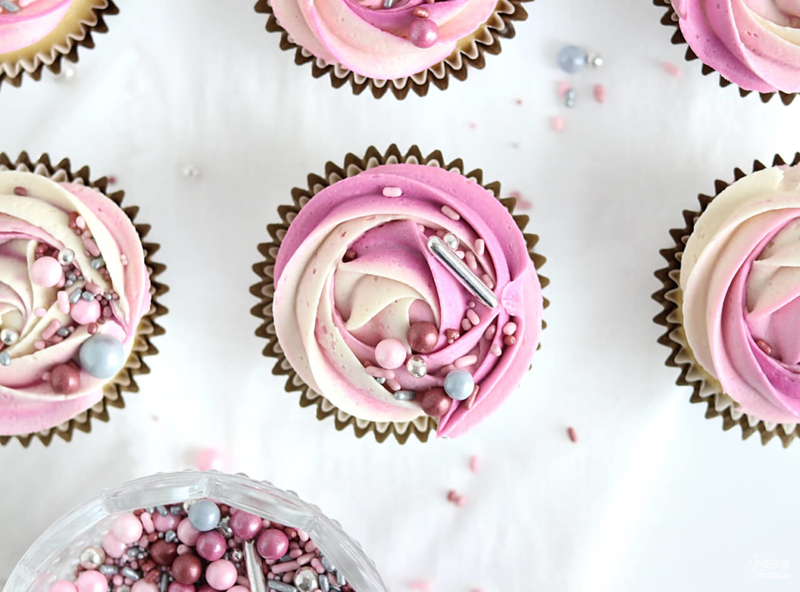 And if you’re looking for a great cupcake recipe for underneath all that magic, I’ve got some tasty suggestions below! First, let’s talk sprinkles. This year I am so delighted to see that SprinklePop has such an amazing lineup of Valentine’s Day sprinkles that will make any dessert look spectacular! 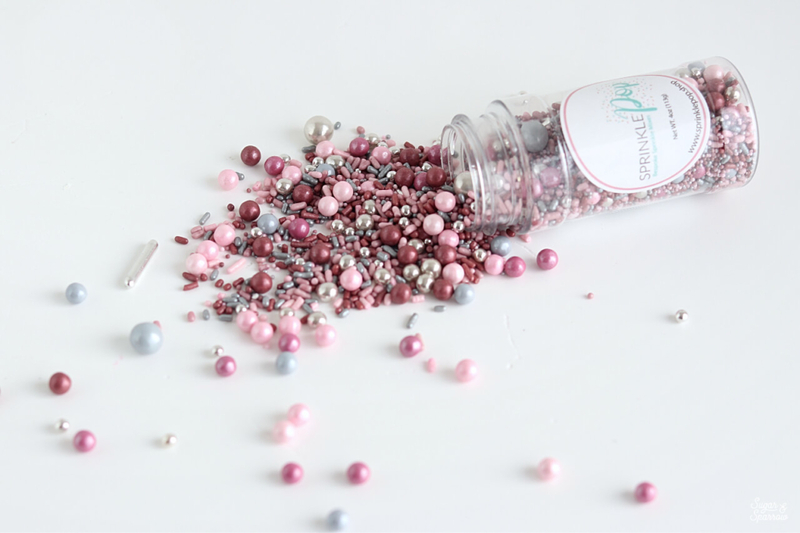 I was really drawn to the dreamy vintage color palette of the Romance sprinkle mix, because just look at it! The blend of burgundy, mauve, pale pink, and silver is such an eye-catching alternative to the traditional Valentine’s Day color palette. So classy! While these sprinkles will look fantastic on a solid-colored buttercream, I thought it would be so fun to create an ombrè effect with white and pink buttercream as I piped these cupcakes. 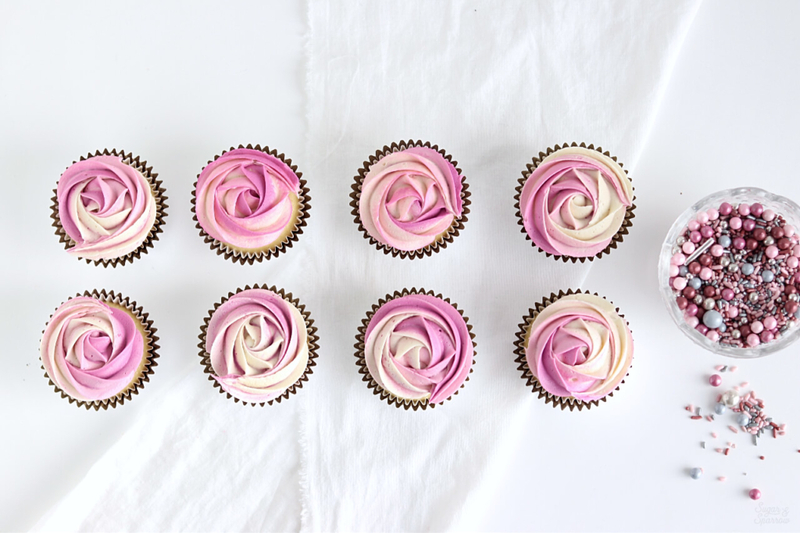 Mixing the colors together into one piping bag is a great way to get a multi-toned rosette without a whole lot of effort. Plus, it really makes these Romance sprinkles shine! For this ombrè look, I divided my batch of buttercream into three bowls. 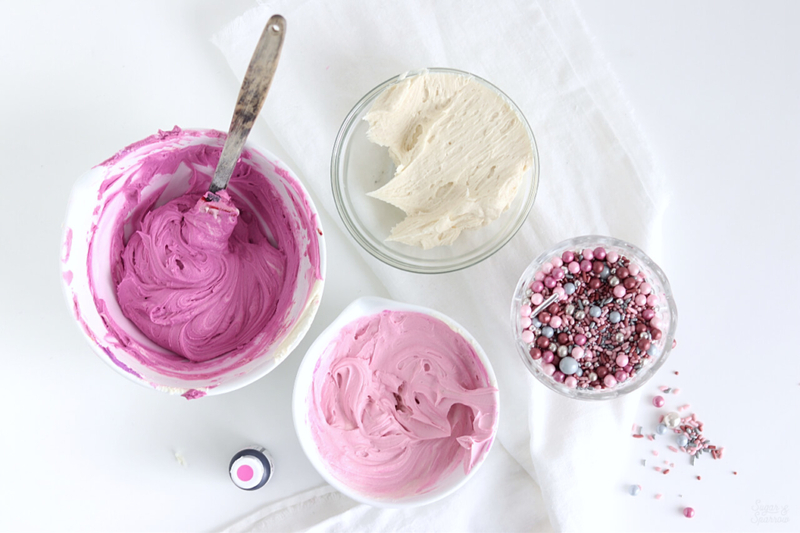 I mixed one of the bowls with Americolor soft gel paste in Fuschia to create dark pink, then mixed a spoonful of the darker pink buttercream with one bowl of white to create a lighter pink. 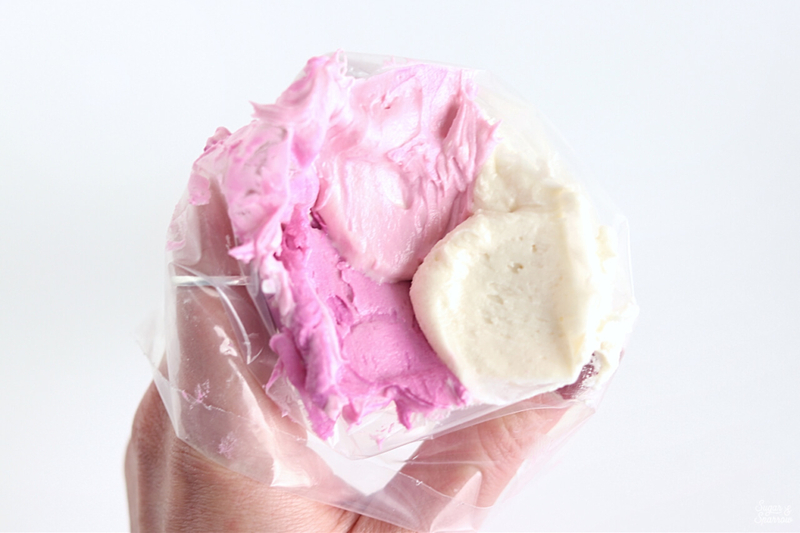 That gives you three colors: white, light pink, and dark pink buttercream. 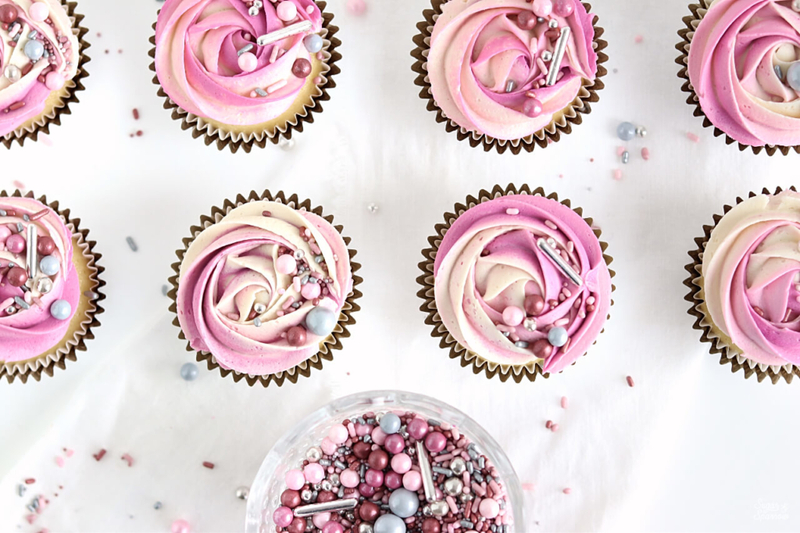 You can certainly use any pink food color gel to create the color palette that you feel will go best with the sprinkles you’re using on top. You should then have close to equal amounts of buttercream colors being piped at the same time. One by one, pipe a swirl starting in the middle of the cupcake and ending on the outer edge. I think the coolest thing about piping rosettes with multi-colored piping is that no two will look identical. Each one is beautiful in it’s own way! After piping the rosettes, finish by sprinkling the Romance sprinkles wherever you’d like! I’ve chosen to add a few sprinkles on one half of each cupcake, but you can feel free to be as generous with the sprinkles as you’d like to be. And voila! 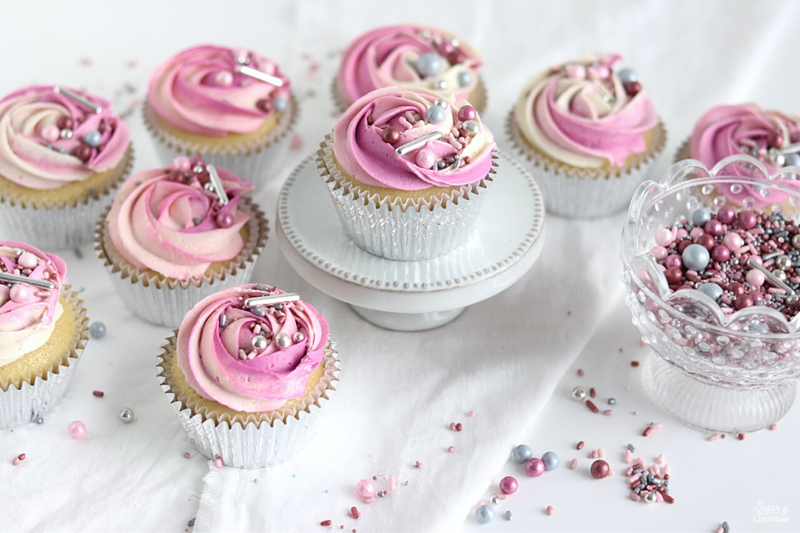 Totally romantic cupcakes for any Valentine’s Day celebration! 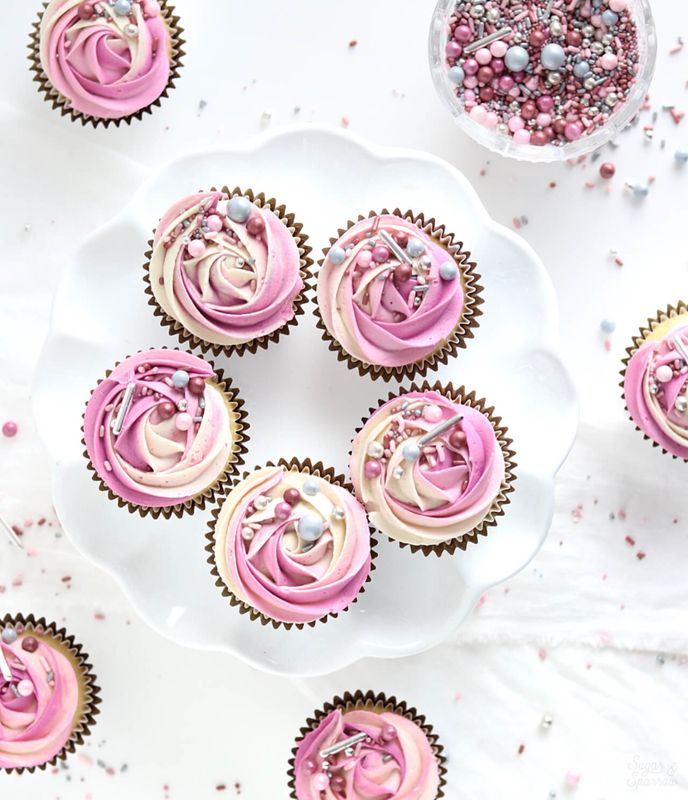 These cupcakes are perfect for a Valentine’s Day dessert, Galentine’s Day soiree, or really any occasion that calls for some pretty cupcakes. The design is super versatile and would look amazing in all sorts of color combinations! Whatever the occasion, let me know if you create some cupcakes inspired by this design in the comments below or by tagging me on Instagram. I love to see your creations!